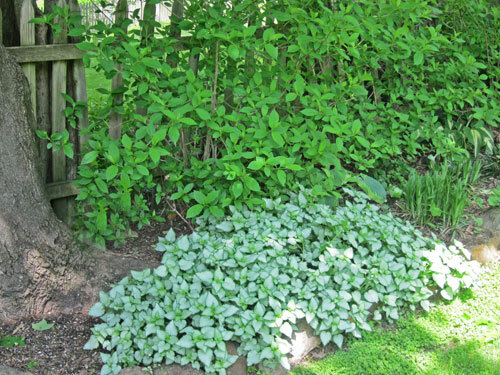 Are you considering shade perennials for your garden? Do you have many old trees on your property creating shade? Do not despair! By using different textured and colored perennial plants you can create a beautiful flower garden. By the way, if your property gets a half a day of sun, you can use plants that like sun. 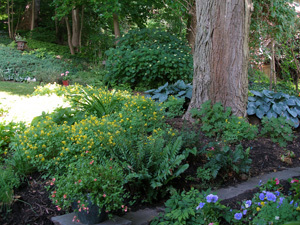 So, how do you creative a beautiful perennial shade garden? Since there aren't many of these plants that have striking flowers, what you must do is concentrate on the following. Textures - wide leaves, narrow leaves, small leaves...place plants with different types of foliage next to each other for interesting contrast. Colors - leaf colors can be outstanding in shade perennials. 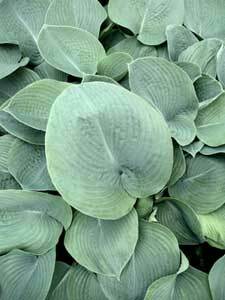 For example, consider Hostas with blue foliage! 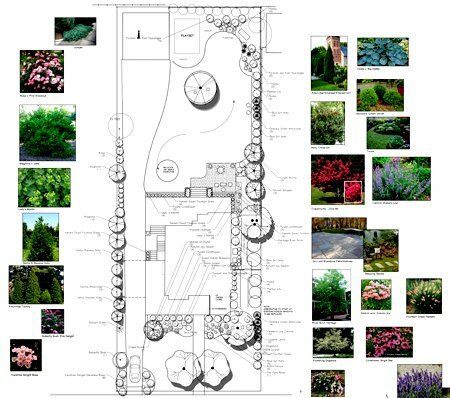 Groupings - plant perennials in groups so that their outstanding features really pop! What a beautiful mixed Hosta display! 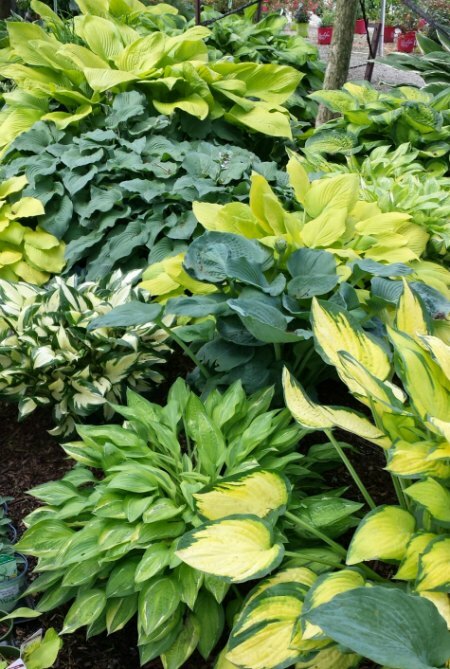 Hostas are know for their attractive foliage. And there are so many varieties...large, small, wide leaves, narrow leaves, solid green, solid blue (different shades! ), variegated, etc. It's hard to imagine a shade garden without some Hosta. 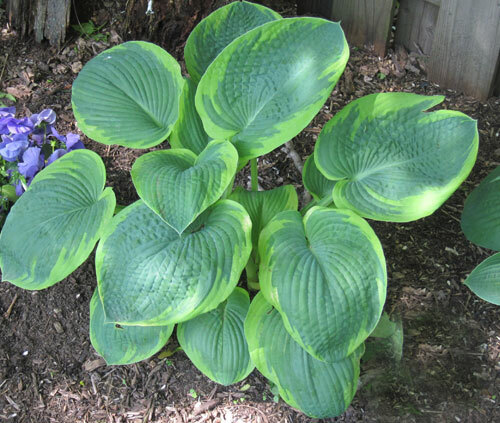 You can even create just a Hosta garden using many different ones, but plant them in groups for maximum impact. Do not use Hosta if you have a deer problem. 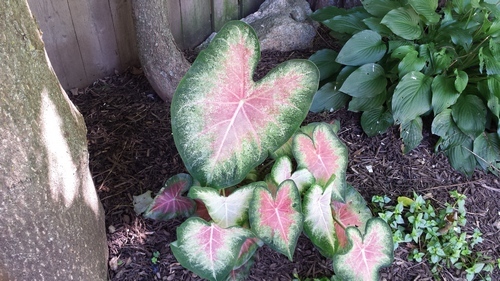 Caladium is a bulb. I buy new ones each year. Ok, not a perennial, but I think you'll agree...a great shrub to use for a shade garden! Read more about Hydrangea. 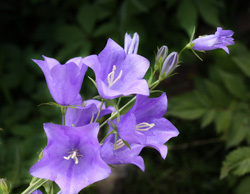 These are low, delicate shade perennials that bloom on and off most of the season. You can choose plants that have white or pink flowers. The foliage of these shade perennials is feathery and very pretty. These plants appreciate some water during very dry periods. 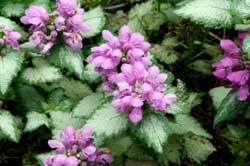 This is a rather showy fall flowering perennial with pretty pink flowers. It's on the tall side and is less common than many others. If you are looking for late season blooms, this is definitely one to consider. If you like grasses but just can't seem to find one for your shady area, this is it...a grass that does well in the shade. Note that there are varieties with different colored foliage. Choose the one with white and green foliage...the yellow colored one is very jarring in the garden...actually I dislike it intensely! What a lovely perennial groundcover (even though I hate the name)! I have it in my shade garden and love it. And here it is in my garden. It's early spring. You can see how lovely it is even without the flowers. Lamium really brightens up a shady area! 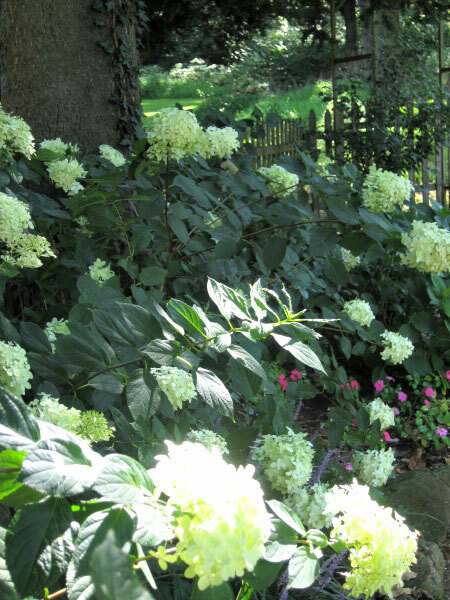 Behind it is Limelight Hydrangea...another great shade plant. Liriope (see below) is the right. 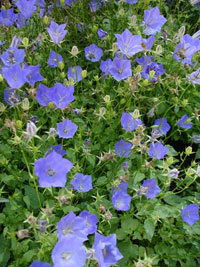 This perennial is a low, grass-like plant which is very hardy. It will bloom in the summer with purple, spiked flowers. It is also available with white flowers. I like this plant a lot and have it in my own garden. This groundcover is absolutely charming. The leaves are heart shaped and very sweet. I always smile and when I see it. Actually, I will be adding this to my garden. 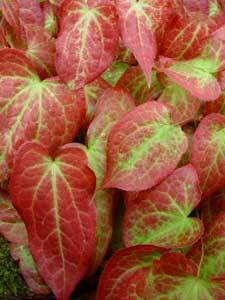 If you are looking for something with a different colored foliage, go for 'Rubrum' which has a pretty reddish leaves. This provides a nice color change for interest without relying on flowers. The nice thing is that the red color is there most of the season. Astilbe is an old shade stand by. The flowers are showier than a lot of the others so you might consider adding a few of these. It comes in many sizes and flower colors. Pretty leaves and very delicate white flowers are characteristics of this perennial. I really like this plant...mainly due to the blue flowers. 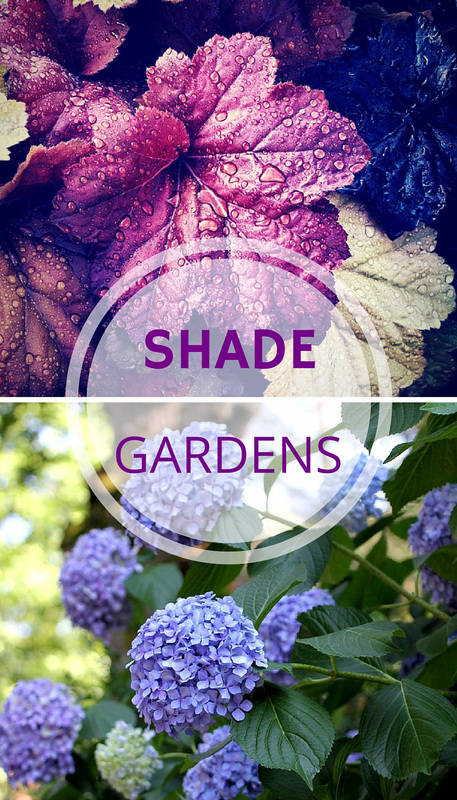 There are many different types of these shade perennials. You can get low growing varieties or tall ones. These are late bloomers so can be appreciated later in the season when a lot of other plants are finished flowering. Wow, there are so many varieties! 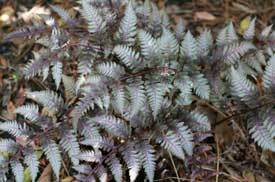 'Japanese Painted Fern' is a very interesting one due to the color of its leaves. It is one of the smaller Ferns. 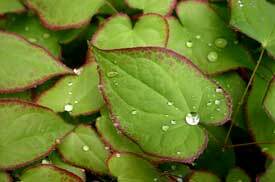 You can also choose some that are quite large, making this a versatile plant to include in your garden. The following are not perennials, but they are very nice plants and you might consider mixing them in or using them alone. This deciduous shrubs is one of the showiest shade plant when in bloom. And it does bloom for a very long time! I have 'Forever and Ever' Hydrangea in my garden and it bloomed almost all summer...you can't get much better than that! Another popular variety is 'Endless Summer'. 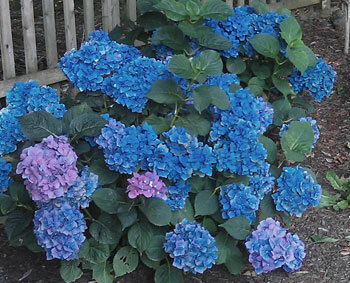 There are lots of other varieties, but if you have never had Hydrangea, I would start with 'Forever and Ever' with it's beautiful blue flowers. If your flowers turn pink and you want the blue color, you have to amend the soil. My Mom has this growing on the north side of her house and it flourishes! It doesn't get too big and produces great berries int he fall. One of the great evergreen shrubs. 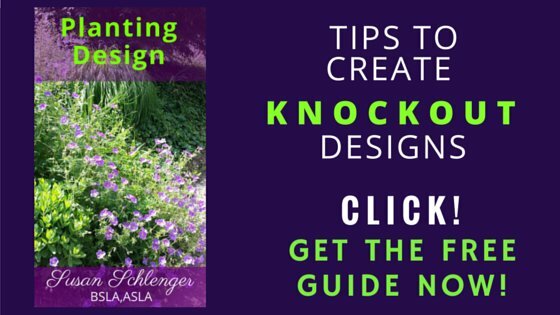 I use it in many of my landscape designs for clients. Coleus is an annual and therefore must be planted every year. But what colors! It is very showy!